1) Policies & Rules - Check with your specific league for more information as policies may vary. Please keep in mind we reserve the right to make adjustments as needed. All leagues are required to follow the specific rules set by the local parks department or facility. Additionally we abide by local laws and regulations as it pertains to our facility permit. 2) Game Length - Regular season games are 6 innings or 60 minutes from scheduled start time, whichever occurs first. The # of innings and length of the games may be reduced due to inclement weather, time constraints and other circumstances. 3) Player Eligibility - Only officially registered players and for that specific season & team are eligible players. Players with existing injuries such as a broken arm are not eligible to play. 4) Referee Disputes - Only team captains may air a grievance with the referee. Once the referee says the decision is final, the discussion concludes and play shall continue in a sportsmanlike manor. 5) Kicking Order - Late arriving players must be added to the end of the kicking order unless already included in the lineup and their spot has not yet passed. Once a team has completed the original kicking order, new kickers may NOT be added. All team players must kick but are not required to play the field. 6) Injuries - If a kicker is injured during a kick, the substitute kicker must be the next person in the lineup and shall continue using the injured players' ball count. Substitute runners may take the place of an injured runner only, and at the discretion of the referee. The replacement must be the last kicker of the same gender to make an out. 7) Substitutes -Teams may substitute officially registered players in the field between innings. Substitutions may be allowed during an inning at the referee's discretion as long as the game is not delayed. Warm-ups are not allowed once an inning starts. Pitchers and catchers may only be subbed for once an inning. 8) Mercy Rule - The game is final after the losing team has completed kicking in the 3rd inning and the opponent is ahead by 12 or more runs. Mound Dimensions - 8 foot radius with the pitcher's plate in the center of the pitching mound. Pitcher - The pitcher shall begin the act of pitching anywhere behind the pitcher's plate. The pitcher must finish with an arm or leg behind the plate. Illegal Pitch - A pitch that is not made by hand, a quick pitch (not allowing the kicker time to setup) or a pitcher that does not begin the act of pitching behind the pitcher's plate or does not finish behind the plate shall be considered a ball. 12) Fair/Foul Ball - A legally kicked ball will be judged to be fair or foul by the position of the ball relative to the foul line. 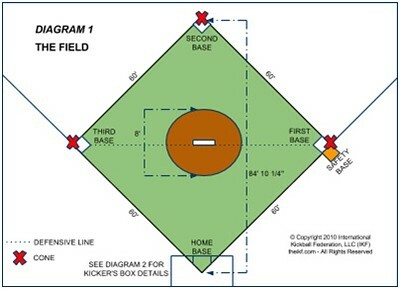 A ball on the ground completely outside the foul lines past the kicking box before the 1b-3b line will be deemed foul. A ball touched or settling in the kicking box will also be considered foul. A fly ball that hits the ground untouched before 1b-3b line and goes foul is a foul ball. A fly ball that hits the ground after the 1b-3b line and goes foul is fair. If the ball is touched at any time it is always the position of the ball, the location of the player relative to the foul line is irrelevant. 13) Dead Ball - A ball hitting an inanimate object or referee is not a dead ball unless the ball is hindered in some way such as by equipment, spectators or players on the sideline etc. A fly ball that hits a tree branch or pole for instance is considered dead and cannot be called an out if it is caught. 14) Dead Play - Play is considered dead when the ball is in control by the pitcher anywhere on the pitching mound. If at that point play is still live, runners may continue to the base they are running to at their own risk. The runner will be returned to the previous base if they stop their forward motion at any time. 15) Strike Zone -Any part of the ball within the strike zone constitutes a strike. 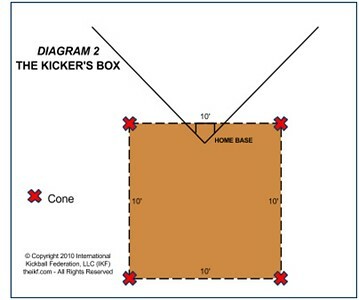 The strike zone is: One (1) foot to all sides of the edge of the plate and One (1) foot in height until the pitched ball reaches the kicker in the kicking box. The ball must bounce twice before home plate otherwise it is a ball unless the kicker attempts a kick. 16) Kicker's Count - 3 fouls is an out, 3 strikes is an out & 4 balls is a walk. Fouls & strikes are separate counts and do not combine. 17) Off-sides - is when a fielder crosses the 1st / 3rd base diagonal line or if the catcher passes the kicker before a pitched ball is kicked. Upon the first off-sides infraction of any kind by a team during the game, a warning shall be given to that team and a ball shall be awarded to the kickers count. If the ball is kicked, the kicker shall have the option of taking the ball or result of the play. Upon each subsequent off-sides infraction of any kind by the same team during the game, the kicker shall be awarded first base with all forced runners advancing. If the ball is kicked, the kicker shall have the option of being awarded first base, with all forced runners advancing, or taking the outcome of the kick. 18) Head Shots - Fielders may throw the ball at a runner to get an out, however if the ball hits the runner on the head or neck, the runner is safe and play is dead at that point with base runners advancing to the base they are headed to. Exception: If a runner is sliding into base, ducking to avoid getting hit, or intentionally uses their head to hit the ball they are out if hit in the neck or head unless the referee calls unsportsmanlike conduct on the fielder. 19) Kicking Order - All players must kick in the original kicking order which becomes final at the start of the game. 20) Kicking Location - The kick must occur with the entire plant foot behind the front line of the kicking box. The plant foot can be partially in the back or side of the box for a legal kick. A ball touched or settling in the kicking box including the plate is considered foul. 21) Legal Kick - Kicks may be made with any part of the leg below the waist; (knee kicks are allowed). Kicks above the waist are considered a foul and an out, if caught. See also kicking location. 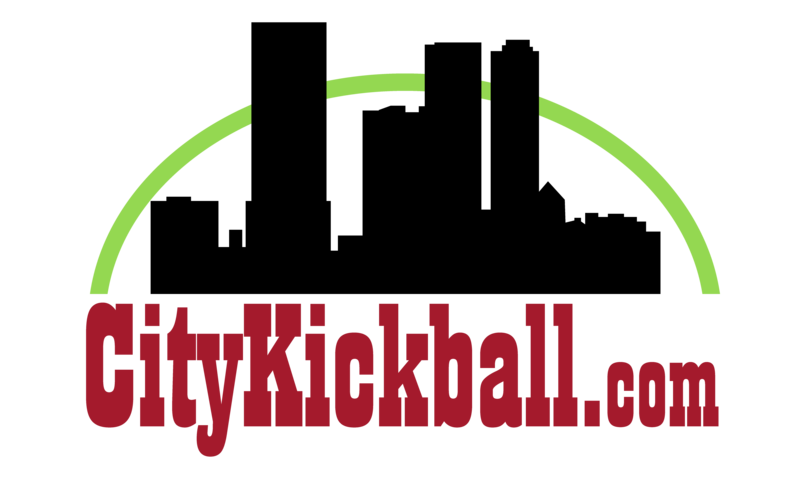 22) Double Kick - A ball touched more than once by the kicker is a (double kick). If a double kick occurs in fair territory the kicker is out. If a double kick occurs in foul territory (within the box) it's a foul ball unless caught which results in an out. 23) Bunting - is allowed however the ball must completely cross the front of the kicking box to be considered fair. 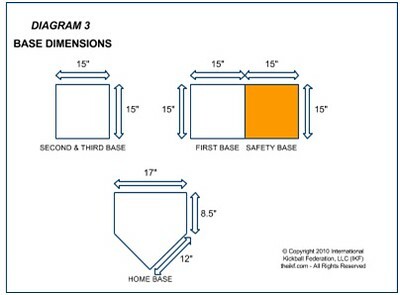 24) Safety Base - is an additional base located next to first base on the runners' right in foul territory. Runners are required to use the safety base if there is a play at 1st base. Runners are allowed to use first base if they are attempting to advance to second base or if the fielder is blocking the safety base. After safely reaching first base a runner shall not use the safety base for any reason. Fielders cannot make an out by using the safety base. They must use the actual 1st base in fair territory. 25) Rounding 1st Base - Any runner that makes a deliberate or aggressive action towards 2nd base may be tagged out after safely passing 1st base. 26) Overthrows - Is when a ball thrown or kicked by a fielder travels into foul territory behind 1st, 3rd or home plate. During an overthrow runners may advance a maximum of one (1) base beyond the base they were running towards or standing on when the overthrow occurred. A thrown ball that deflects off a runner is not an overthrow. If the fielding team attempts to get an advancing runner out, the overthrow rule is voided and play continues. The referee has final discretion. 27) Tagging Up - Runners must tag up for balls caught in fair or foul territory. If the ball is 1st touched in foul territory but not caught, it remains a foul ball and runners cannot advance. Runners may advance once the fielder makes initial contact with a caught ball. 28) Force Outs: 2 runners may not occupy the same base. A run will not count if the 3rd out is the result of any force out (includes tag of a forced runner). 27) Baseline - The Baseline is 3 feet to either side in a straight line from the runner to the base they are attempting to reach and is only established when a ball tag attempt occurs. 29) Leading and stealing - are not allowed. All home plate calls including Balls, Strikes & Fouls & off sides. Keeping score & inning number. Home plate referee is also the head referee and may override another referees call. Keeping the game on time and enforcing the league sportsmanship policies. Safe/out calls at their base and calls at any base that does not have a referee. Foul ball line calls if they have a better view than the home plate referee. Ensure base runners don't leave the base early and tag the base while run past it. Keep team coaches and players away from the foul lines.